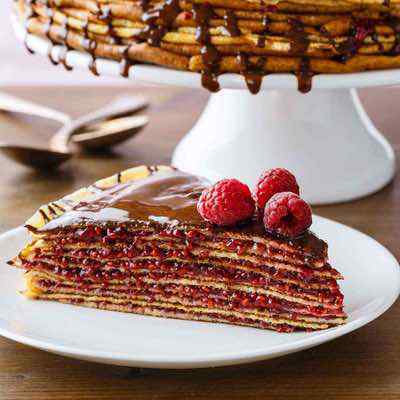 Crêpes are a dish that you probably didn’t think you could have while on Paleo because they are often eaten in sweet form as a dessert and made with wheat flour. But it only takes a little bit of tinkering in order to make them perfectly OK on Paleo, and we’ve found some of the best around. 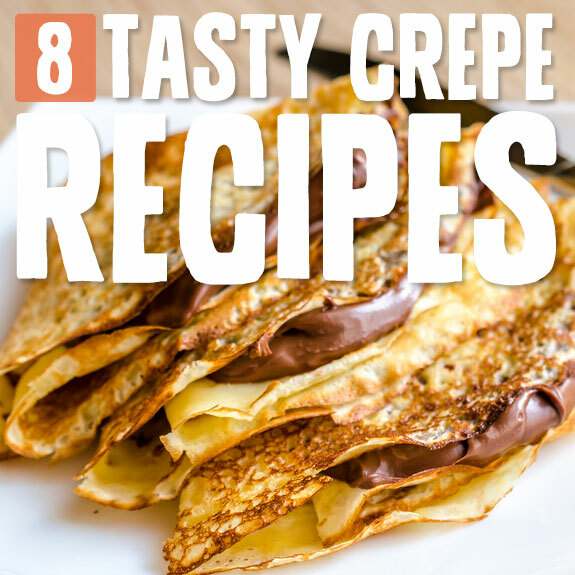 You can enjoy the following crêpes recipes without fear that you are endangering your Paleo progress. 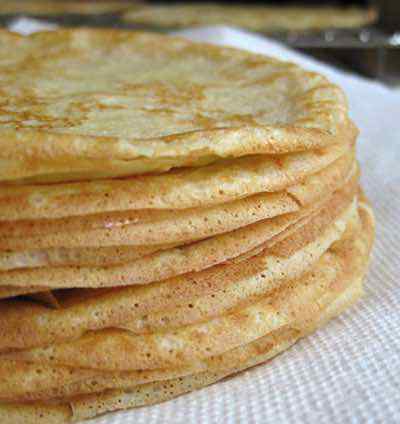 These polish crêpes are sure to make your favorite crêpes list, and are using coconut flour instead of a wheat-based flour so you get the same taste and texture of a crêpe without having to break any Paleo rules. 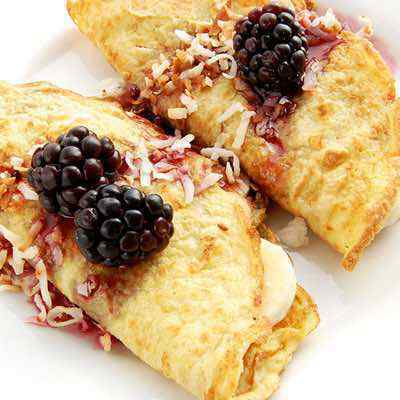 Frozen berries are used for the topping, so this will be a crêpe that comes loaded with antioxidants, and you may actually end up feeling good after eating this, rather than feeling guilty that you’ve spoiled your diet. The point of Paleo is to have foods you enjoy without including ingredients that will set you back. Here are some crêpes that have a lot going on, and all of it is good. She’s managed to use entire bananas in the crêpe batter recipe, along with coconut flour so you’re avoiding any grains from these. There’s a sweet potato puree, so you’ll get added fiber and some antioxidants while having a most delicious snack, dessert, or breakfast. To top it all off she has caramelized bananas for the top, and suggests an assortment of additional toppings if you really want to go all out. 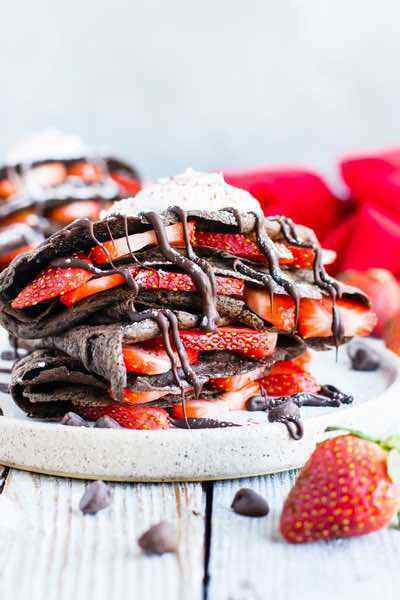 These are the sort of crepes that you’ve always wanted, but never knew you could have. These are billed as the best grain-free crepes around, and we’d have to give a nod of support to the title. The key is not using any sort of flour substitute, but going with eggs to get the job done. That and a bit of special gelatin is all you need to form the right consistency, and have crepes that taste the way they should. You can then serve them up however you’d like, since there are plenty of Paleo friendly topping options, including fresh blueberries as shown. 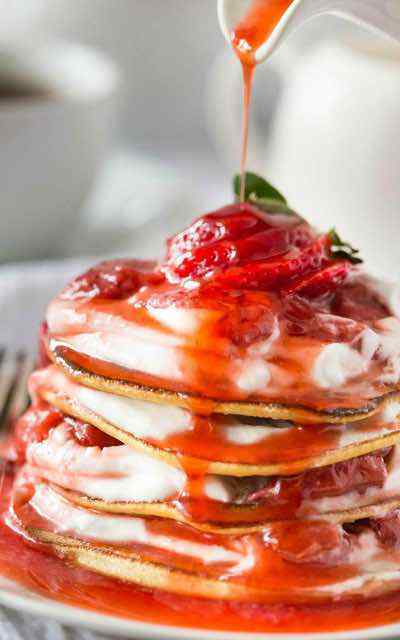 You can also go with any other berry, or stick with a simple spice like cinnamon, and a little maple syrup. These crepes will blow your mind, not just because of the way they taste, but for how easy they are to make. She’s using a combination of arrowroot flour and coconut milk, a unique combination that produces better than acceptable results. The use of liquid stevia is going to be debatable for some Paleo followers, but most say that it’s approved for Paleo eating. When it comes time to top them off, you can go with something like almond butter for a nutty, creamy taste, or even sprinkle chopped nuts on them with a little raw honey. 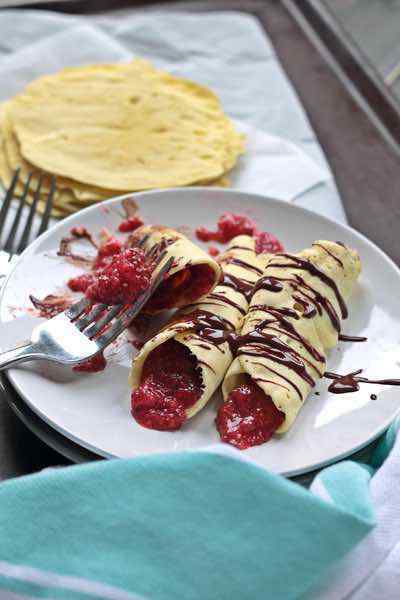 Get your chocolate fix at the same time as your crepe fix with these hazelnut butter stuffed crepes. 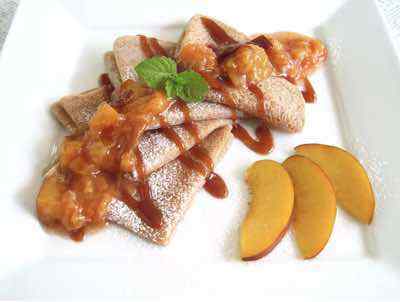 The crepe itself is made from almond flour, so these are grain-free. 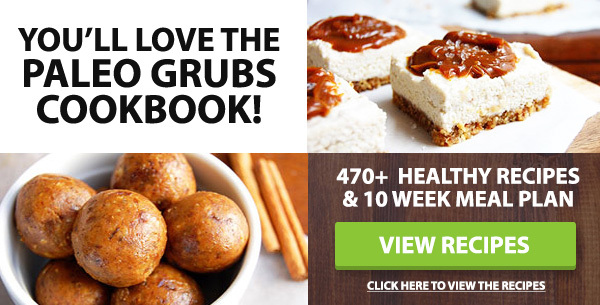 But the best part of this recipe is that they include separate instructions for how to make raw cacao roasted hazelnut butter, which you’ll want to make on a regular occasion because it’s totally Paleo and totally delicious. This is a butter that you can use whenever your chocolate cravings surface, and it works amazingly well stuffed inside of a crepe. So French! Maybe you’ve never thought to eat apples with your ham, or vice versa, and we’re betting you never thought to combine the two in a crepe. This gives them a nice savory sweet taste that combines the best of both worlds. 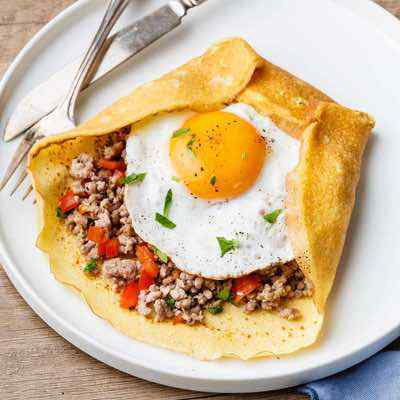 Eggs mix with two types of flour for a perfect crepe consistency. Coconut cream is used to keep this dairy free as well as grain free. Then of course comes the ham and apples, proof that you can eat Paleo and still have a yummy treat when you feel like you need one. If you’re the type of Paleo eater that allows a bit of cheese here and there, be sure to take them up on their option of adding some shredded cheddar to this. These crepes have so many good things going on in them, and the nice thing is you may not even notice. That’s because good things can come in small packages, and they’re using hemp seeds as well as flax meal, both of which are high in omega-3s and come with their own host of benefits. 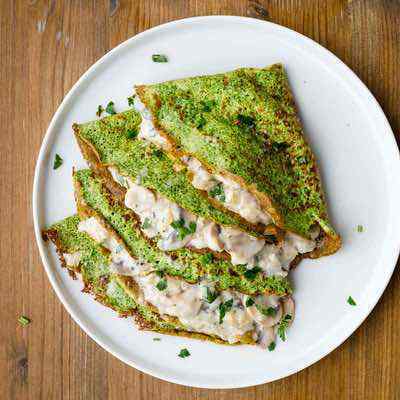 This makes these crepes one of the few crepes you’ll eat that helps you top up on your omega-3s. But don’t let that scare you off, as they’re also big on flavor with a wonderful apple compote made with no refined sugars.